One of the great things about being based in the NYC-area are the ridiculous foodie promotions and happenings that seem to occur weekly. We’re spoiled with variety and places to explore, trying dishes from all over the world on a small little island. Global food at our fingertips, or at least the tips of our forks. 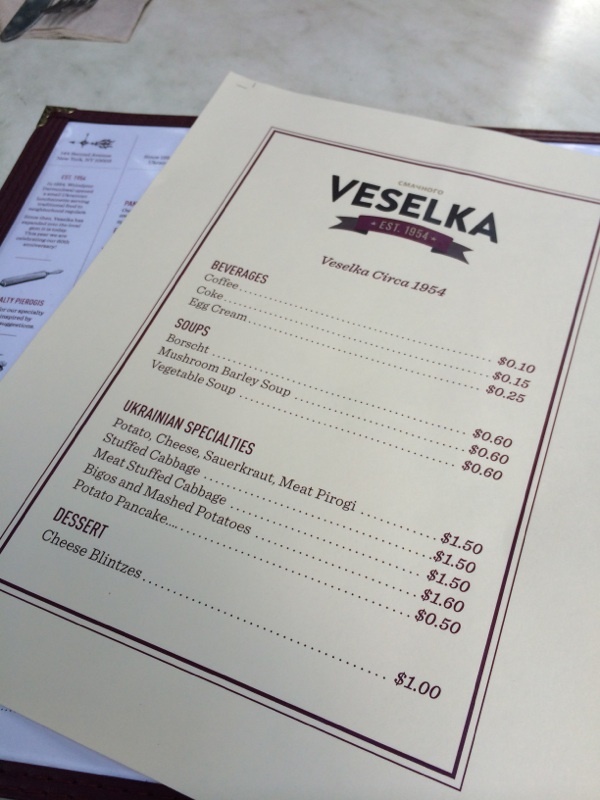 The latest food adventure we went on was at Veselka, a traditional Ukrainian restaurants in the East Village of Manhattan. Growing up with a Polish Grandmother on my father’s side, pierogi, sauerkraut, horseradish and beets were a normal thing. So I was excited to try a Eastern-European taste of home. So why Veselka? They were offering 1954 prices on the menu, in honor of their 60th anniversary. Unbelievable and amazing — the only catch, it was happening for only 54 minutes (of 1954 prices). So we left way early hopefully get a table. And we did. Timing is everything in these sort of NYC-foodie events. You have to be there at the right time, schmooze the right hostess and get your spot, without angering any other patrons. It’s a skill we’ve mastered. To start, here is a look at the menu we were presented with at an outdoor table for two. Seriously, it was unreal. My initial reaction was to just order one of everything on the menu, but I we contained ourselves and went with a sampling instead. 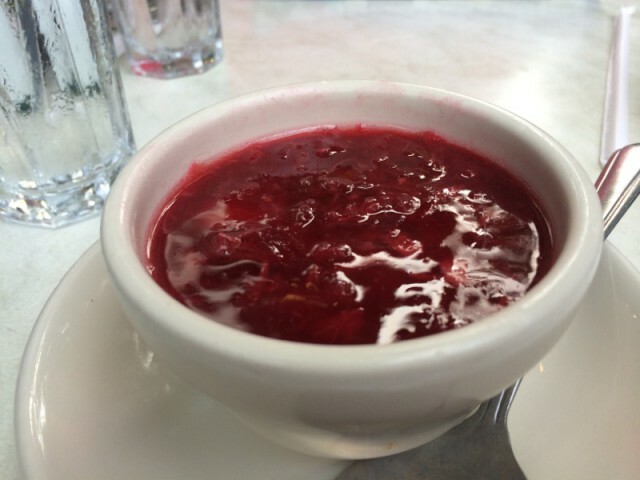 First up was a bowl of the borscht, which is a beet-based soup. It was fantastic, nice and sweet — although I am one of those people who loves a bowl of soup on a hot day, so I might be biased. A great start to a nice and authentic meal. it only got better from there. Next up on the menu, I went with the pierogi — one of my favorite meals from my childhood and today. Wanting to taste everything they had to offer, we were allowed 4 pierogi — so I naturally chose one of each kind: potato, cheese, sauerkraut and meat. Served on the side were caramelized onions, sour cream and applesauce which paired well with each kind. And finally for the meal, I went with the meat stuffed cabbage — or gołąbki, as I grow up knowing. My Grandmother is famous for her version of these, although only makes them once a year and then freezes them to enjoy later. Again, all about the timing. 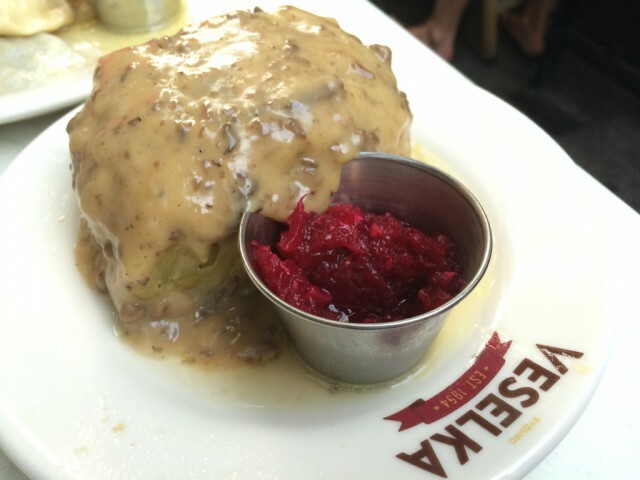 Topped with a mushroom gravy (which is something I haven’t had added to the dish before) the stuffed cabbage was great — but filling! The beef, pork and rice wrapped up into a little Eastern European cabbage burrito — which is really what this is — was so good. 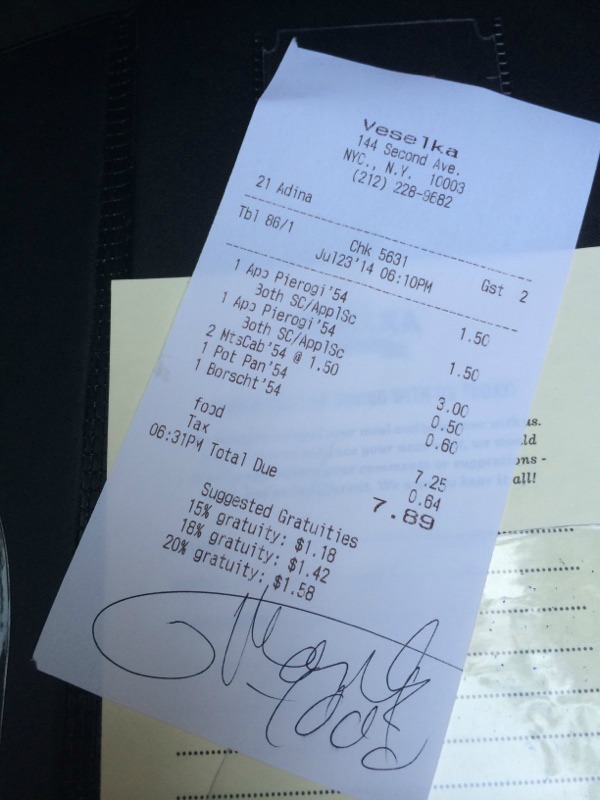 Rookie Chef would highly recommend this spot, even with the modern day pricing. 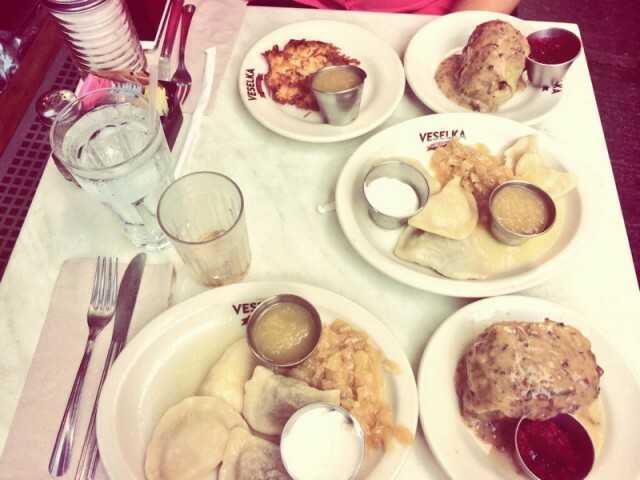 Take a look at their full menu here and enjoy some pierogi. You won’t be disappointed. 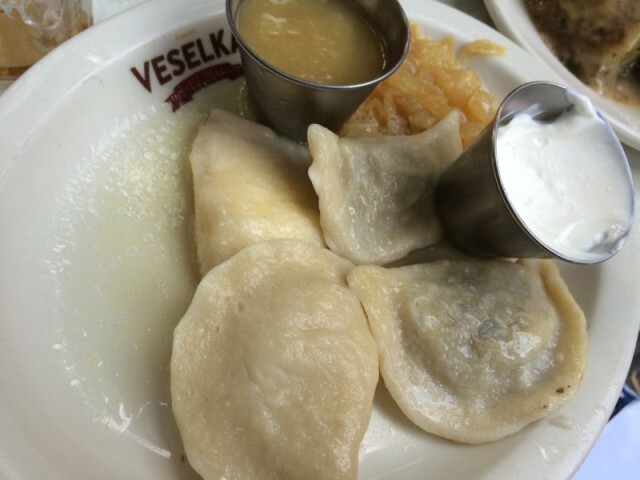 Tags: cabbage, East Village, Golabki, LOCAL EATS, Pierogi, Polish, ROOKIE CHEF, Ukrainian, Veselka. Bookmark the permalink.